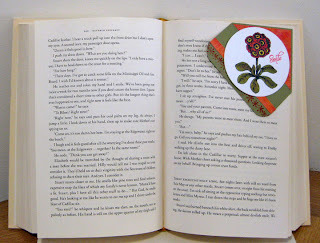 Mona's challenge at Timeless Tuesday this week is to create a Corner Bookmark showcasing a beautiful Flourishes image. 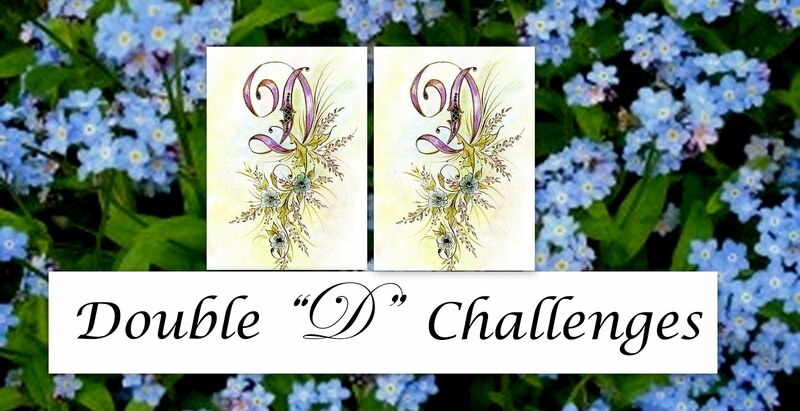 Check out Flourishes challenge for a link on how to make the bookmark. Since I do not have any border punches with me, I decided to emboss the edge. I used the Primrose stamp and colored it with Copics. This was a very simple bookmark design to make and I know I will be making more for gifts. 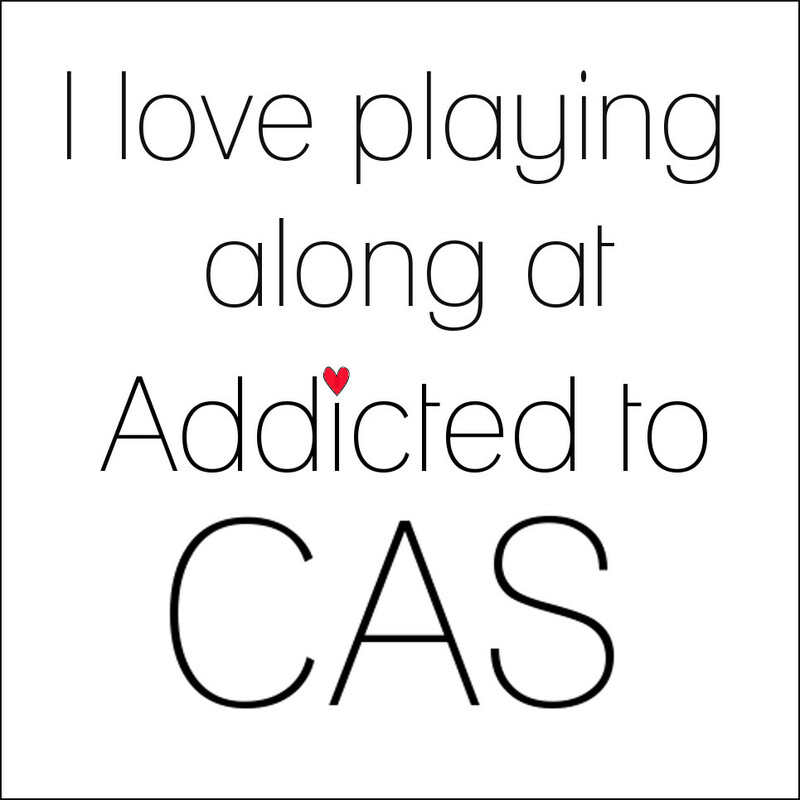 My DH is already using this one and thinks that it is great. Welcome! 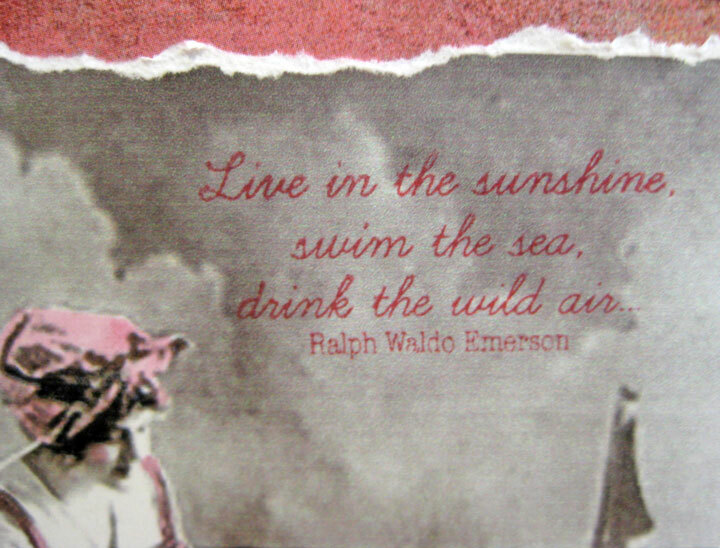 I have not been posting any cards the last few days....too busy enjoying the sun and warmth of the islands. 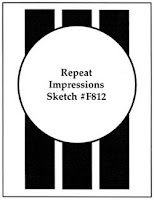 I did take time to make a quick card using the sketch from Card Positioning Systems. This was very simple since I used items that I had already punched, stamped, and ready to use....just assembled together. Love the colors in the butterfly pattern. Cute Card: Challenge is winged things. Stamp: GKD Sentiment from "Inside and Out"
This is a quick post to enter this shaped card in a couple of challenges. I used Spellbinders Label 4 to cut the card base from Blue CS and the frame from a scrap of CS. I used Mark's Finest Papers stamp set "Hello Sunshine". This is very appropo for today's weather on the islands. I will used this card in a gift from the islands. Valentine's Day is over but I still have another Valentine to post. 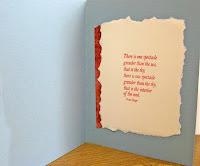 I made this for Beate's Timeless Tuesday challenge to make a card for someone you love and incorporate red into your project. I also used the sketch again from The Sweet Stop. Timeless Tuesday: Make a card for someone you love. 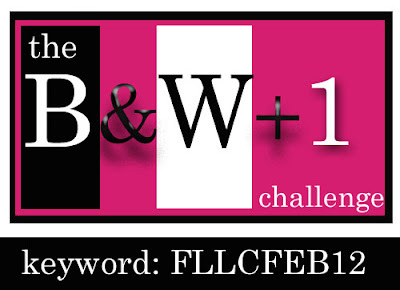 Fussy and Fancy: Theme is with all my heart.Papertake Challenge: Black, White and Red all over. Stamps: Flourishes "From The Heart"
At Sugar Creek Hollow, this week's challenge is to make a MASCULINE VALENTINE card in a vintage, shabby chic or primitive style. 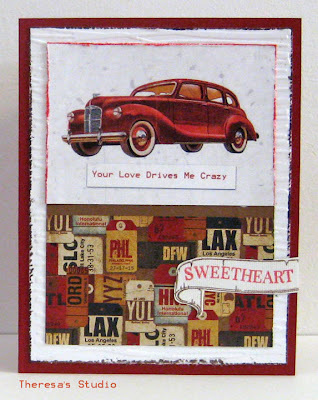 I had this great image of an vintage car in my digi files from Paulette's Make it with TLC. I added "Your Love Drives Me Crazy" with the computer. 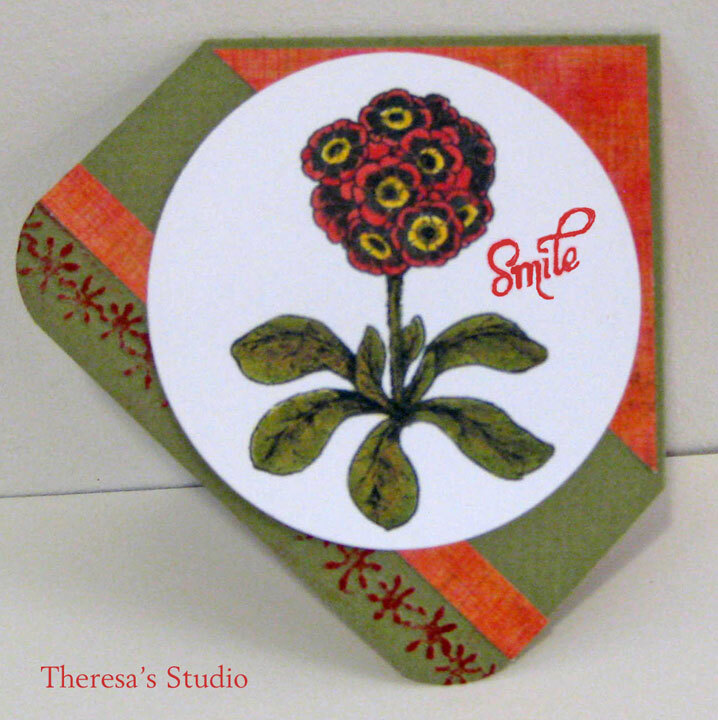 Added a scrap of pattern paper from "World Traveler" by Teresa Collins. 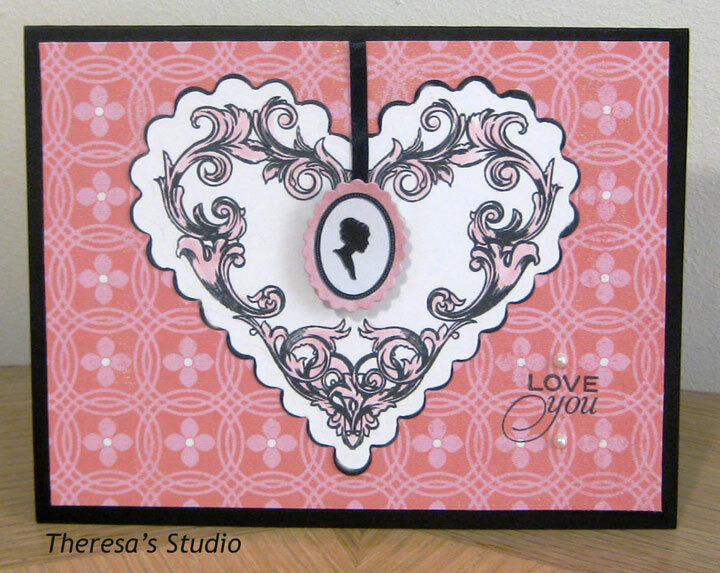 Stamp: Flourishes "From the Heart"
Paper: Teresa Collins "World Traveler"
I hope everyone had a lovely Valentine's Day. My project today was made using a sketch from the What If ? Wednesday challenge at The House That Stamps Built. 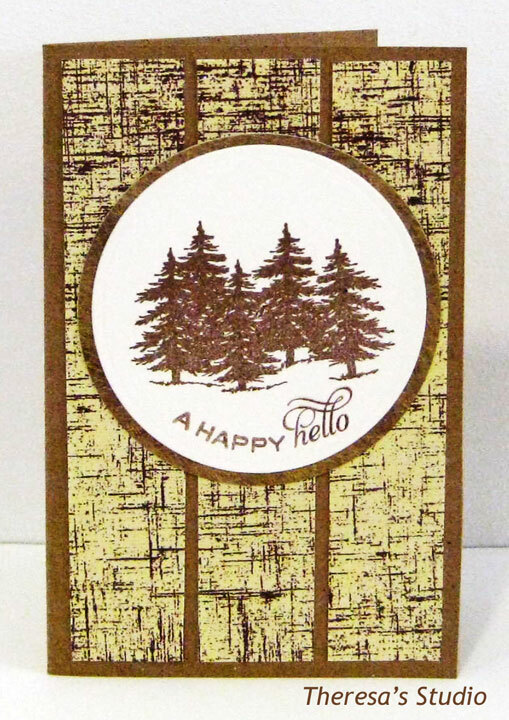 I used one of their stamps Large Pine Forest for this almost monochromatic color card. 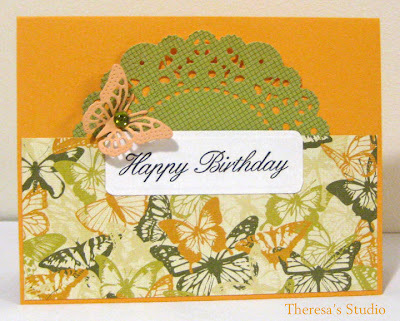 The base card is Kraft CS with strips of pattern paper from DCWV paper pad. 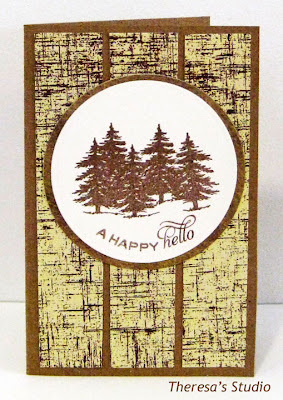 The trees were stamped on ivory CS with Memento Rich Cocoa and cut with Nesties circle die and placed on a circle mat using another pattern paper from the same pad. I finished by stamping a sentiment from Flourishes "Taglines" that I curved a bit to fit on the circle. 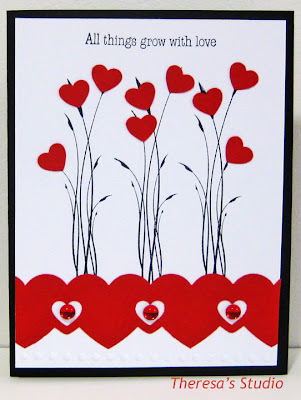 This was a simple and easy card ...love this sketch for its simplicity. Also would look good with a touch of twine.....maybe the next time. 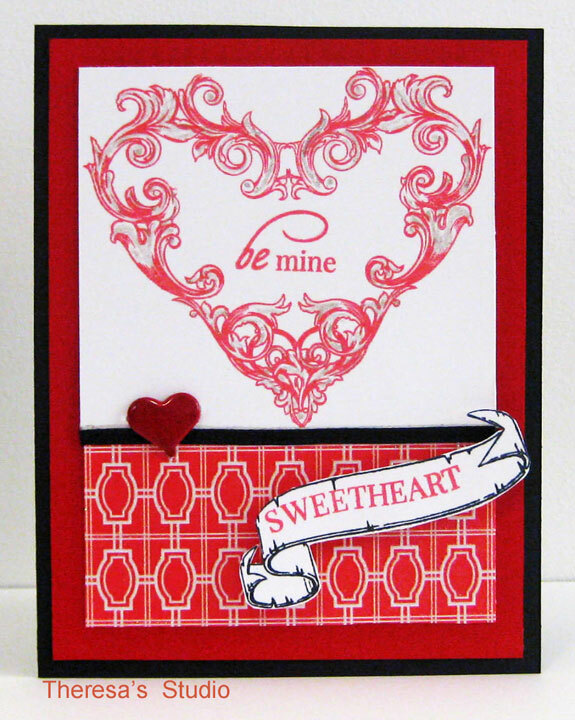 At There's Magic In The Air, Danie May brings us a challenge to design a card or project for someone we love and use the colors pink and white with one other color but not red. 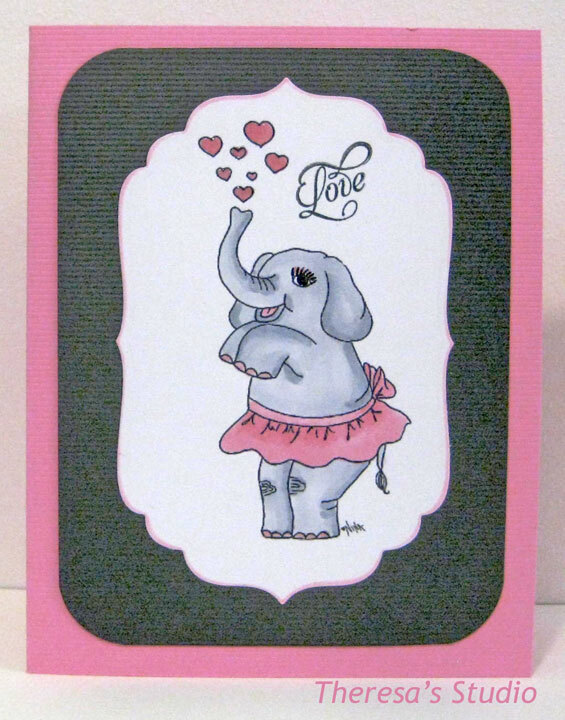 Since I used the cute Paper Cupake image "Tons of Love", I used gray as my other color with pink and white. I added a sentiment "Love" from Flourishes "Taglines" with Memento Tuxedo Black and some Glossy Accents to the hearts. Card base is textured pink and mat cut with Spellbinders Labels 4 is textured dark gray cs...all from stash. Used Copics R81, R83, R85, C1, C3. There's Magic in the Air: For someone you love. Digital Tuesday Challenge: Use your stash.....papers all from stash as well as the digi that I had printed a long time ago. At Timeless Tuesday this week, Maki's challenge is “Fly Away With Me” – Use bird images and/or elements for your creation. 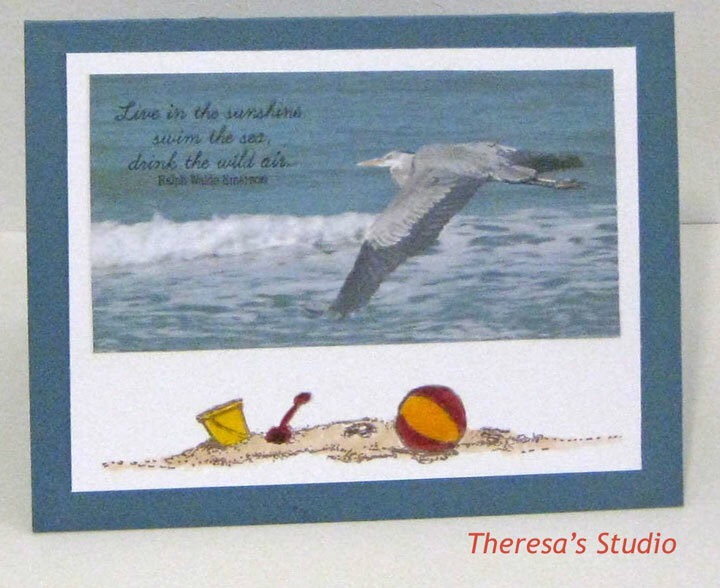 In keeping with my beach themes of late, I used a combo of a photo and stamps to create my beach scene card. The photo of a Great Blue Heron in flight was made by husband on Captiva Island several years ago and is one of my faves of his bird photographs. I stamped the sentiment on the picture that I printed on White CS and cut out and placed on a White CS mat stamped with the beach scene and colored with copics and highlighted with Glossy Accents. Stamps are Flourishes "Beach Life". Card base is a textured slate blue CS. Timeless Tuesday #155: Fly away with me. Sentimental Sundays: Feel the love. Annabelle Stamp Blog: Say it in red, black,and white. 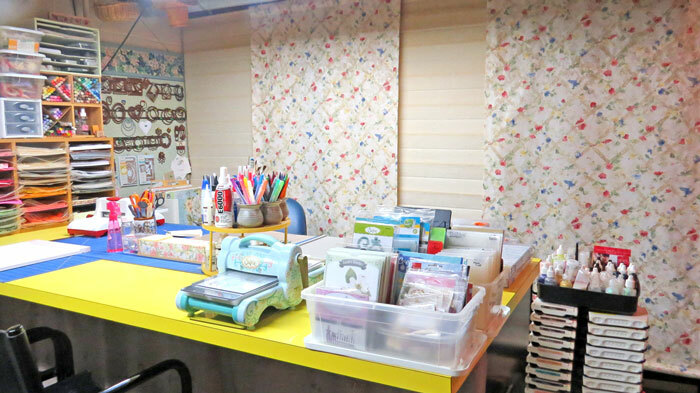 Craft Your Passion: Anythhing goes but no pattern paper. 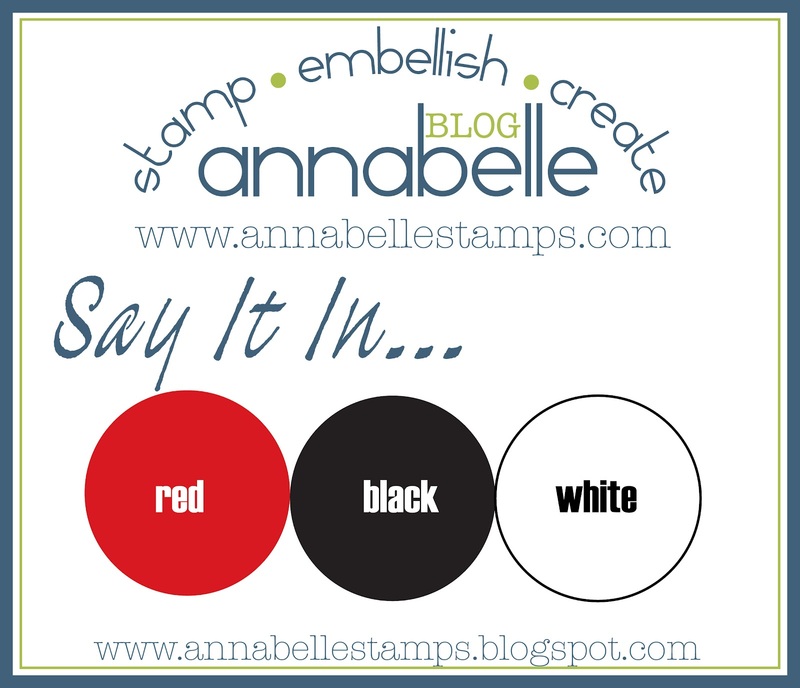 Saturday Challenge: Red, black, and white and texture. Hope you can see the dry embossing along the bottom. Texture also from the attached hearts and border and gems. Flourishes' second noon challenge is to simply use a frame – whether it be stamped or with a die cut – on your card or creation. 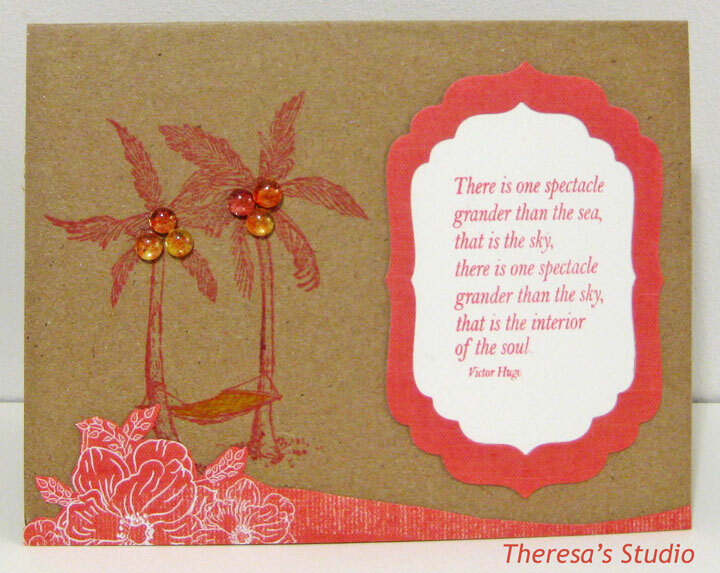 For my entry, I decided to frame a verse from Flourishes “Beach Life” using Spellbinders Dies for a tropical design card. 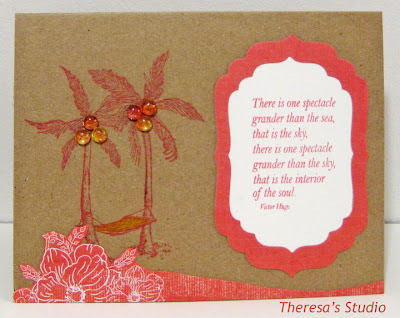 I stamped the palm trees on the Kraft CS and added a border cut from pattern paper with a tropical theme. I attached the framed sentiment. 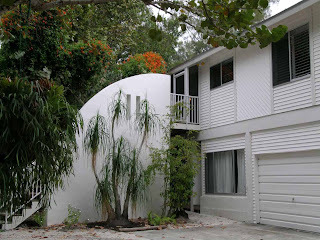 Dewdrops were added as coconuts on the trees to complete the island feel. 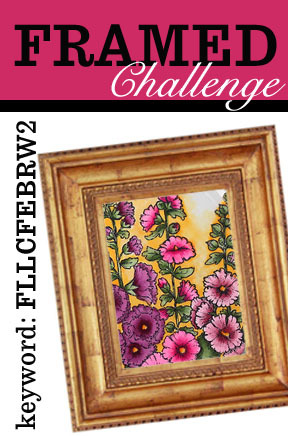 See the complete challenge and details here. This design is a bit different from most of my designs.....more of the CSA style and influenced by our stay on an island. Flourishes is kicking off their new release with noon time challenges. The first one is to simply be inspired by this photo shown– be it for the colors chosen, materials or textures that are alive in it. 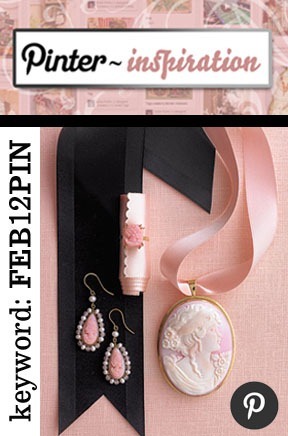 I chose to be inspired by the pink and black colors and the cameo in the photo. 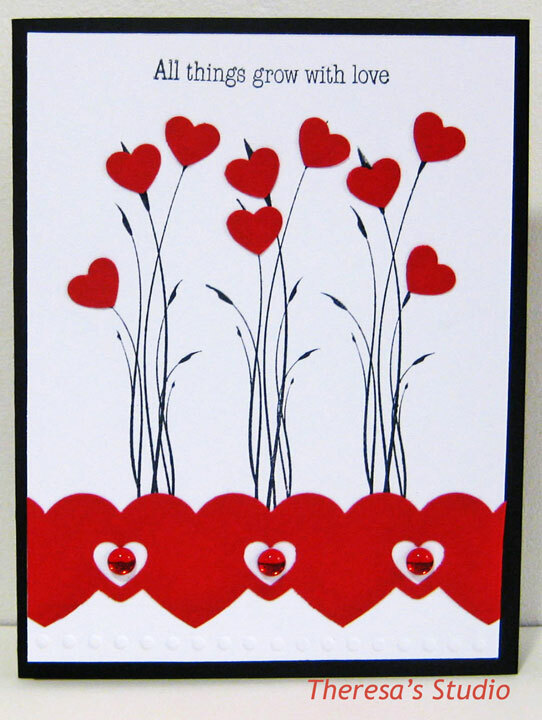 For my card I used a heart with a cameo hanging on a ribbon and popped it up in the center. A simple "Love You" and a couple of pearls completed the project. Sugar Creek Hollow has a fun challenge for us this week. 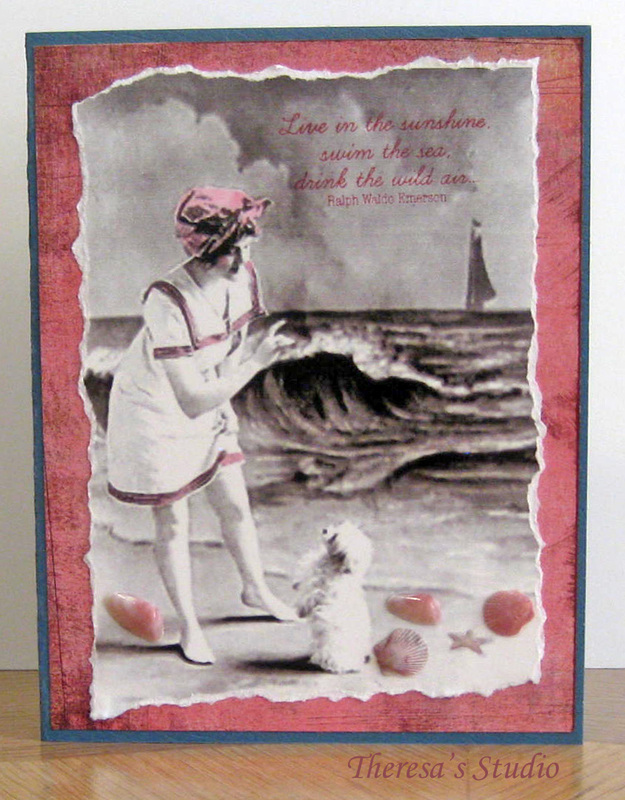 They want us to make a vintage, shabby chic or primitive card that depicts a VACATION AT THE BEACH. 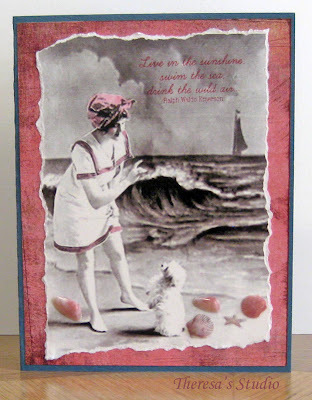 This challenge is perfect for me this week since I am at the beach and I searched for shells on the beach to use on my vintage card. I used a great graphic of a Bathing Beauty from Graphics Fairy that I found searching the web. I printed the image using a sepia finish and then added some pink highlights using a Copics marker. I tore the edges of the image before attaching it to a mat from a BasicGrey paper pad. I then used a card base of textured blue CS. 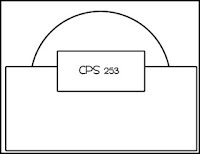 The shells were randomly placed on the sandy beach in the graphic. I also colored the starfish and added some Glossy Accents which I hope show on the card. 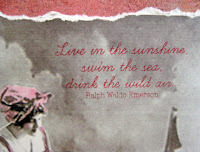 I used a sentiment from Flourishes stamp set "Beach Life" stamped in Memento Rose Bud ink ( I included an enlarged photo so that you can read). I also finished the inside with leftover scraps and another sentiment from the same set. I love how this card turned out with the great vintage print. 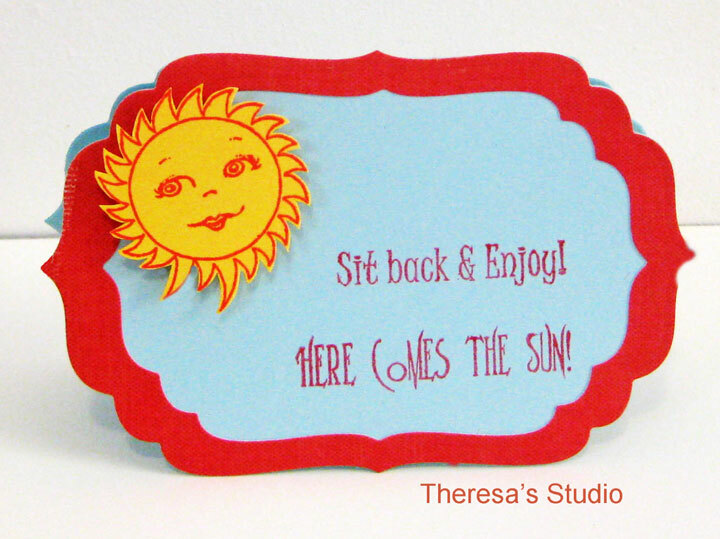 I enjoy making cards even when in Florida enjoying the warm weather and sun. For Flourishes February Release the challenge is as simple as it sounds — use black and white with a pop of just one color. Just that simple! 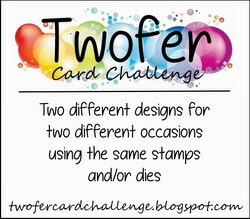 Use Flourishes stamps if you have them, but if you don’t, play along anyway — you could win some! The winner will receive all three sets that are a part of the newest release! 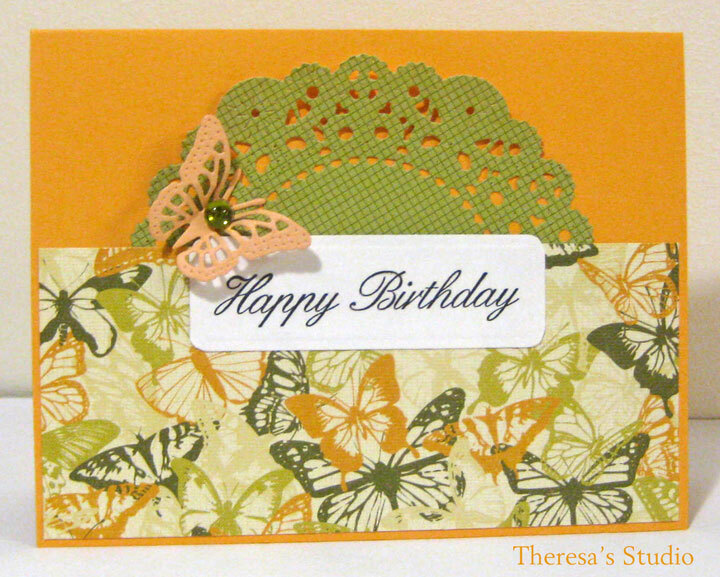 My card is made with Flourishes "Year in Flowers-Set 1". 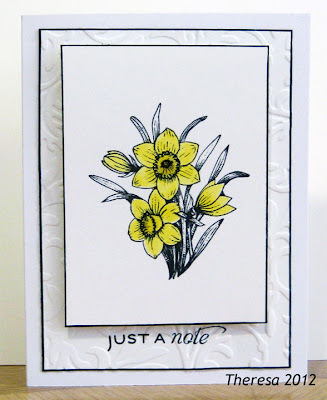 I stamped the daffodils with Memento Tuxedo Black and colored the flowers with Copics yellow. I edged the image with Memento Tuxedo Black marker and adhered with pop up dots to a mat embossed with Cuttlebug EF Victoria and also edged the mat with black. 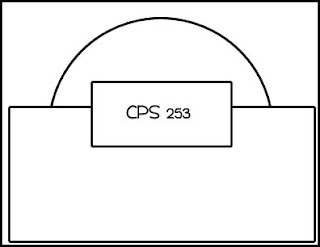 I placed this on a card base of GKD White CS. The sentiment is from Flourishes "Taglines". 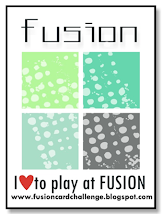 My card is very clean and simple since I have limited supplies to work with here in Florida. I wanted to use black as the base card but did not have that. But I think the stamp is the star of the card. 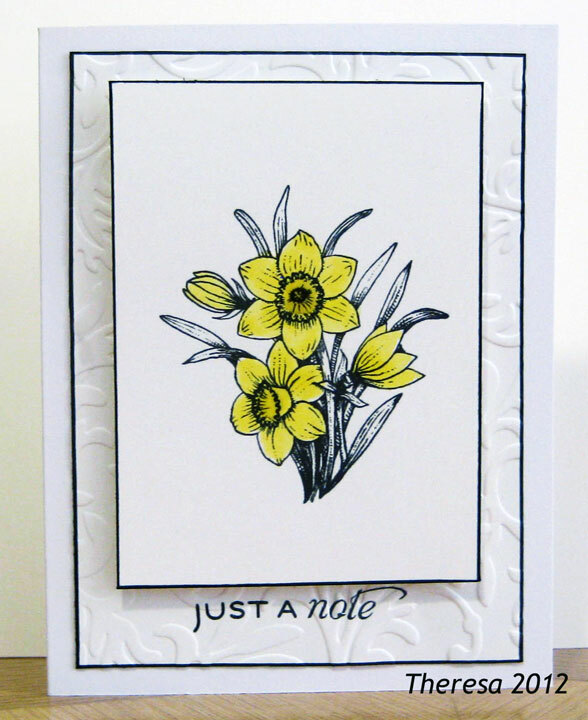 Daffodils are a favorite spring flower. I'm Back!!! Did'ya Miss Me?? ﻿ Hello to all my blogger friends! 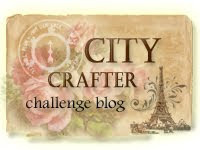 In case you have been wondering why I fell off the face of the blogger world, I have been busy,too busy to make any cards, and just took a break from posting and also commenting. I have missed all my friends and visiting daily with you. How is everyone.... it's time to catch up and get back into the groove. 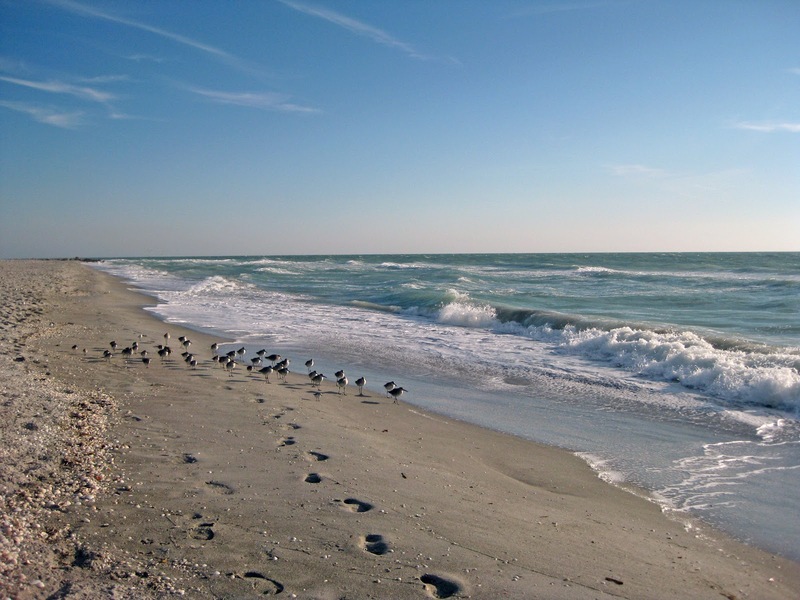 Al and I are now in Captiva, FL for 6 weeks of warm weather and sunny days. But this morning is a bit cloudy and we had a partly rainy day yesterday. But that's much better than the cold and snow at home. 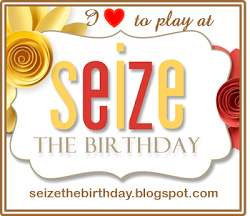 Looking forward to dropping by to visit on your blogs today. Missed our visits, girlfriends. 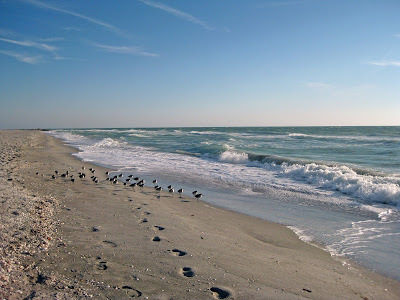 If you have a chance, check out about our days on Captiva at http://captivadays.blogspot.com/ my daily writings of life on the island.